Ever since the Great Financial Crisis of the 2008, the ‘fat cat banks’ have been vilified by the public and the politicians; and rightfully so. While the average citizen was left struggling with an underwater mortgage, the government used taxpayer money to bail out these ‘too big to fail’ banks. There were no criminal prosecutions and most top executives went out with a golden parachute. And of course, none of these stopped them from continuing to foreclose on desperate homeowners. Despite the drubbing their public image has received over the past decade, it seems that the big banks have only paid lip service to the lessons they have supposedly learnt from the crisis. In both the United States and in Europe, these large banks (which have still not been broken up) continue to oppose regulators’ efforts to rein them in. Note the keywords ‘below investment grade credit ratings’. Translation: junk debt. Of course, banks don’t want this junk on their balance sheet. So they turn them into structured products such as Collateralized Loan Obligations and sell them to the market where they end up in retirement portfolios or large mutual funds. Déjà vu anyone? Just how much has the banks’ leveraged loan portfolios increased? Well, according to Dealogic as at end October 2017, total volume has increased by 38% on a year over year basis. Total outstanding is now $1.25 trillion and has already exceeded the full year amount set in 2013. Using data supplied by Bloomberg, the Financial Times determined that out of the ten largest banks in the business, nine of them have already beaten their 2016 full year totals. The only exception is Wells Fargo at $69 billion so far this year. Here are some figures from the other banks: Bank of America ($110 billion), Goldman Sachs ($79 billion), and Barclays ($72 billion). As for regulations, well, here’s the thing: they’re not regulated by any financial body, even though they are bought and sold like securities. The strongest ‘regulation’ on leveraged loans is guidelines which are hardly the same as stringent regulation. Not even close, in fact. And with yields so low across the market, investors desperate for yields are investing in these risky loans. 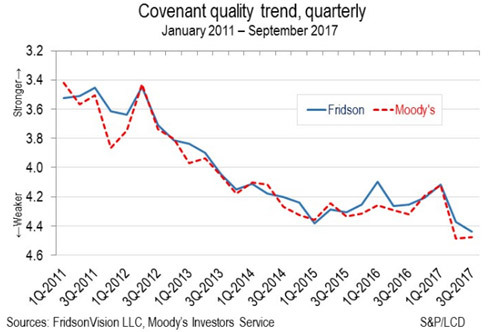 While these loans are ostensibly collateralized, research has found that the loan covenants on these loans are becoming dangerously loose. 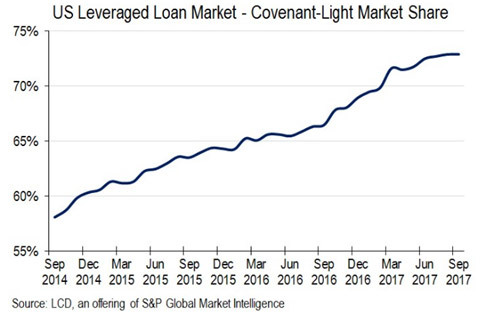 Since 2011, the covenant quality on these loans have continued downward, and such ‘covenant-light’ loans have surged to become the unquestionable majority of the leveraged loan market. The big banks of course, have shown no indication that they intend to scale back on the volume of these loans or even tighten up the covenant quality? Why would they when they don’t have to? Further, the fees they earn on these leveraged loans are massive. For the first 10 months of 2017, total fees amounted to $8.3 billion, slightly below 2016’s full year total. Could these leveraged loans be the next ticking time bomb in our financial system? Before we close out this article, we would like to bring your attention to our neighbors over in Western Europe. Over there too, the big banks have scored a massive victory as the European Commission just scrapped the proposal to ring fence the banks’ riskier investment banking operations from its retail banking operations. It looks like it’s business as usual for the big banks, as the specter of the last financial crisis continues to fade from the public’s short term memory. But intelligent investors know better and are always prepared. They are diversifying their portfolio into precious metals, which serve as a long term financial hedge against the financial system as a whole.